One of my all time favourite restaurant dishes is fillet steak with garlic prawns – served rare! But whenever I order this some diners will always question the whole meat and seafood combo and whether it really works. So what is Surf and Turf? 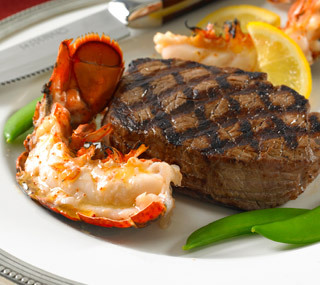 Surf and Turf or more commonly ‘Surf ‘n’ Turf’ or better still, ‘Beef ‘n’ Reef’ (Australian); is a restaurant term that refers to a dish incorporating both a portion of meat and a portion of seafood. The term appears to have originated along the East Coast of the United States during the 60’s. The “Surf” in the title clearly refers to seafood – usually lobster – but it can be any other type of crustacean. “Turf” is any type of grass-fed land animal but usually refers to beef in the form of steak. The steak part is usually grilled with dark brown grill marks clearly showing its proximity to fire! The seafood is usually boiled, baked or grilled to retain its contrasting purity in both texture and colour. Whereas sceptics might argue their dislike because of the decadence of the dish with its extravagant ingredients (traditionally fillet mignon and lobster) others will defend the complementary pairings where one item works almost as a seasoning; a vehicle to carry flavour e.g. frying salmon fillets in bacon fat is about boosting flavour, wrapping the salmon in bacon is about insulating the fish from the intense heat of the grill and stopping them from sticking to the pan whilst also continuously basting them in salty, smoky fat that renders out of the bacon! Salmon with streaky bacon is very simple to make. One piece of Salmon fillet per person, wrapped in streaky bacon (OR use lardons should you be cooking with larger pieces of salmon). Please don’t skip making the mushy peas which add a grassy ‘turf-like’ note to the dish. The lamb shanks must be cooked for a long time to become fall-off-the-bone tender. Unless using a pressure cooker or a slow cooker, cook in the oven at a low heat for 2 hrs+. Do yourself a favour – if entertaining with this do not bother telling anyone about the anchovy in the dish as people have an immediate prejudice against these salty fish. They dissolve into the red wine meaty juices and add a saltiness that you just cannot get with salt and no one will know that they are there! Spaghetti with prawns and chorizo is just a pasta version of a stylish restaurant starter: Scallops and prawns / black pudding. By adding the pasta you can make the prawns go further; the chorizo renders out its smoky, paprika fat which coats the spaghetti. Substituting the prawns for scallops could make this a more decadent alternative.